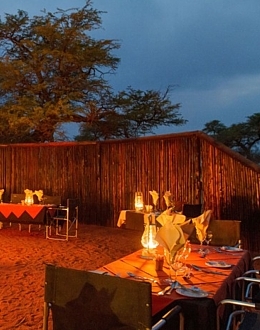 The Camelthorn Kalahari Lodge is aptly named as it finds itself between two sand dunes in an area peppered with Camelthorn trees which are endemic to this region. The 12 rondavel-style thatched huts are sparsely set against a backdrop of red dune sands, yellow grasses, piercing blue skies and the greens and browns of the wide-spread Camelthorn and Acacia trees. An inviting, sparkling blue pool which attracts the odd Oryx despite there being a waterhole in close proximity is the first sight to catch your eye as you enter the main area of the lodge. The lounge has comfortable leather seating and is next to the bar that leads to a boma area where large fires are lit and barbecues can be enjoyed at night. An upstairs restaurant overlooking the majestic sights serves an alternative area where sumptuous meals are served. The kitchen is also replenished with organically grown vegetables from the neighbouring farm, Twilight and guests truly enjoy the finest and freshest culinary delights that the Kalahari has to offer.